Entity Framework Core (EF Core) is one of the latest data access technologies for any type of application in the .NET Core framework. Entity Framework Core is based on Object-Relational Mapper or ORM model. Basically, the object-relational model is a technique which helps the developer to establish a relation between the entity model class of the application and the data objects of the relational database. In this technique, developers can create a relation between the entity model class and database objects, i.e., tables in the relational database in an object-oriented way to perform different types of operations like fetch data, save data etc. Entity Framework Core is a lightweight extensible framework which can support cross-platform development. Entity framework core provides auto generated code. It helps us to reduce development time. It also helps us to reduce development cost. Using this framework, developers can visually design entity models and can map the database objects. It provides a multiple conceptual model to map with a single schema object. For starting this development, we need to have the below prerequisites. Now, open Microsoft Visual Studio 2017 and click on File --> New --> Projects. Select the Web Application Project template and click the OK button. In the Project Template Box, select Web Application (Model-View-Controller) options and click on the OK button. Now, a blank project solution has been ready. Now, select the solution file and right-click and select Add --> New Projects. 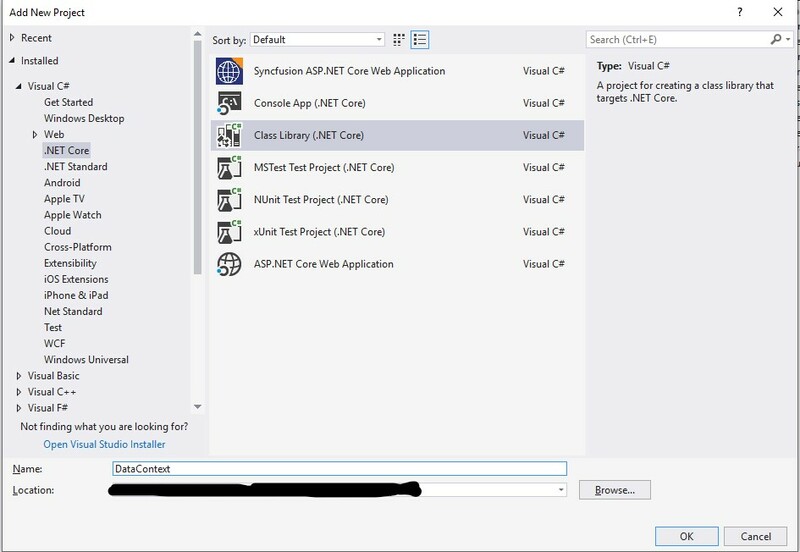 Provide a Project Name as DataContext and click OK.
Now, install the below Nuget Packages related to the Entity Framework Core. Now, create a folder called Models in this project and add the below models. Employee.cs --> Employee class which contains Employee details List. In this entity, DepartmentId and DesignationId is acting as a Foreign Key related to the Department and Designation Entity. Now, create another folder called DataContext. Within this folder, add the class file name EFDataContext.cs which will contains mapping code related to the entity and database tables. Now, add the below code in this file. In the above file, we overrode the method OnConfiguring() of the DBContext to specify the database and sql server credentials so that Entity Framework Core can connect with the database server for the CRUD operations in the applications. Now, open the Package Manager Console and run the below command – add migration migration1 (here migration1 is the alias name which can be changed). Now, run the command update database. Now, open the SQL Server and check the mentioned database is already created. Now, in this application, we will create a CRUD operation for Employee data objects. So, we need to insert sample data using a database in the Department and Designation tables so that when we will try to create employee from the application we can generate the department and designation lists. Now select the DemoApplication Projects (MVC Application) and provide the reference of the DataContext Library which we already add. Now Select the Controller Folder and right click and select Add --> Controller. 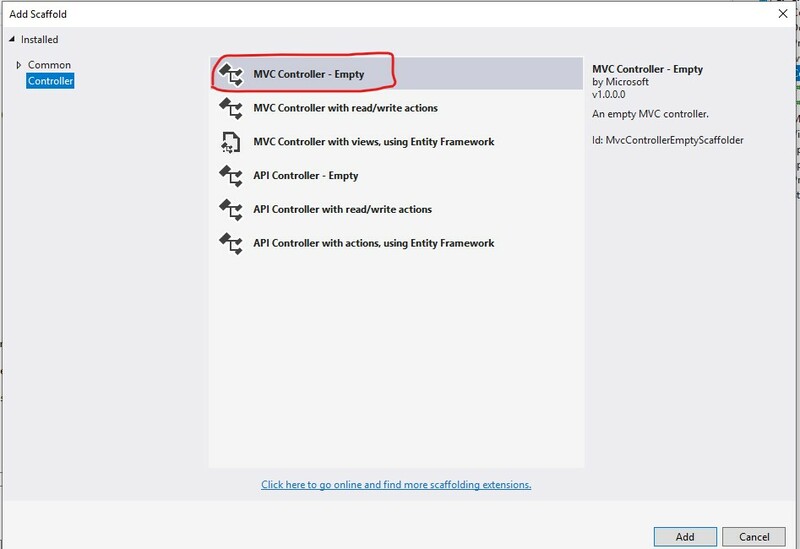 Provide the Controller Name as EmployeesController and Click on Ok Button. In the View Folder, create a new folder called Employee and then add an empty view named index.cshtml. Now open the Index.cshtml view and the the below code. In the above method, we create two ViewBag inststances for Department and Designation Lists. Now Select the Employee folder under views and add another empty view. Create.cshtml and add the below code in that file. Now, return back to the EmployeesController.cs file and write down the method to save the data in the database. Note that, in this method we need to use HttpPost verb so that it can be fired on Form submit event from UI and it takes Employee data as argument. After successfully saving the data, we will automatically redirect to the Index UI. 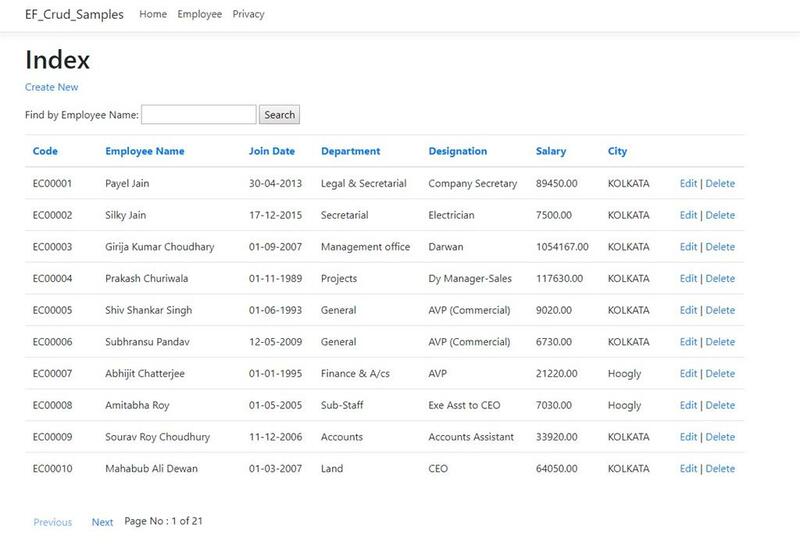 Now run the application and then click on Create New Button in the Employee Index UI. After providing proper data in the form, click on the Submit button. Now, the Employee Index Page starts to display the information. Now, again run the application and check the Index UI of the Employee. Now, we want to edit the existing employee data. For that, we have already created the "Edit" button in the Index UI. On click of the Edit, it will redirect to the Edit() of the controller. This method returns the same create.cshtml view. After making the modification on the existing data, we need to submit that data. For this, we need to called another HttpPost Method called Edit() in the controller. After submitting the change, related changes have been shown in the Index Page. Now, add another method called Delete() for deleting the existing data in the EmployeesController File. Now, on clicking on the Delete button for any employee, that data will be deleted from the index list as well as the database. Now, we can use a stored procedure to fetch any data from the database. For that purpose, first, we need to create a store procedure which accepts employee id and returns all the records of that employee. Now, open the EFDataContex.cs file and add the below method to execute the stored procedure using Entity Framework. Now, change the code of Edit() method as below. Now, run the application and check all CRUD operations. Now, to add sorting, we first need to make changes as below in the Index.cshtml pages. In the above code, we pass SortField, CurrentSortField and CurrentSortOrder to the Index Page so that we can sort the data in the controller and return to the view. Now, in the above code, we create another method called SortEmployeeData() which stored the Current Sort Field and SortOrder in the View Bag. Also, this method is used to find the property name and then sort that data accordingly. Now, run the application and check the index page of employee. Now, for adding the search functionality, we need to add the below code in the Index.cshtml page just above the Index table. First Select the DataContext project and add a folder called Paging. Now add the below code at the end of the Index.cshtml page. In this article, we discussed how to implement basic CRUD operations including sorting data and paging in the index page. I hope this will help the reader to understand how to use entity framework core in the real life applications. Suggestions and feedback related to this article or any subject are most welcome. For any further query or clarification, ping me.